In the previous episode of Kumkum Bhagya, Pragya is considering leaving Delhi. After running into Daadi and avoiding Abhi, she is keen to go back to Hoshiyarpur. Meanwhile, Shahana tells Prachi that she put stickers on Rhea’s car, calling her a robber. Rhea assumes that Prachi has done this prank. She convinces a guy to kiss Prachi in college. Prachi slaps the boy and then later slaps Rhea too. In tonight’s episode, Rhea hears people talking about how Prachi did the right thing by standing up to her. Rhea still has a mark from the slap on her face. She decides to not just get revenge on Prachi but ruin her life. When she returns home from college she has more bad news. The security expert is back with the footage. Rhea is scared because it will prove that she tried to frame Prachi. Prachi and Shahana are back home in Chachi ji’s house. Pragya has made home-made food for them. They get excited to eat a warm meal after a long time. Just then Chachi ji also comes back home. She brings up the topic of Prachi’s arrest. She tells all over the colony people are saying that Prachi is a robber. She tells Pragya that Prachi and Shahana went as waiters at a big party and robbed an expensive necklace. Pragya is shocked when Prachi tells that she did go to the party as a waitress and not because she was invited there. Rhea also is in for shock because of the CD that Abhi is watching. It will prove that Rhea is the real criminal. However at just the right time the CD stops playing. Aliyah had manages to scratch the CD enough to stop people from playing the ad. Mira and Aliyah are glad that Rhea was spared from the anger of her father. Meanwhile Prachi tells Chachi that they became waiters because she asked them to pay rent. 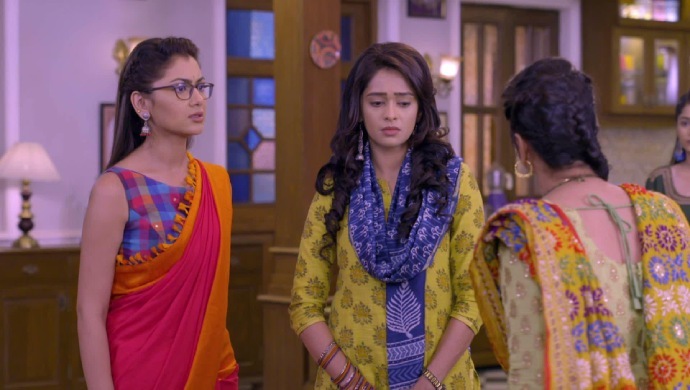 Pragy gets angry when she hears how Chachi ji has been mistreating Prachi and Shahana. She tells her to stop calling her daughters robber. She also asks her to have some shame for mistreating them. Hearing this, Chachi asks Pragya, Prachi and Shahana to leave her house. Where will Pragya go from here? Stay tuned to find out.